With their rich color, our dark brown bleach resistant hand towels are a perfect choice for virtually any home or business. The dark color looks great, even with repeated use, and the natural earth tone is a perfect fit for gyms, homes, country clubs and other businesses. Absorbency. Our towels wick away moisture fast, and their thickness is designed to be as absorbent as possible. Softness. These towels can even be used on sensitive skin. Great wear. Tight stitching and quality materials mean these towels will look great, even with a lot of use. Heavy, multiple washings won’t even wear them down. In fact, most of the time, these towels will only need one wash to rid of soiling and dirt — although heavy soiling may require two washes. Versatility. These towels can be used in your home, business, spa, salon or other setting. They work great folded up on a counter for your guests to use or hanging up so you can grab them on the go. No matter why you need towels, these fit the bill nicely. Great looks. 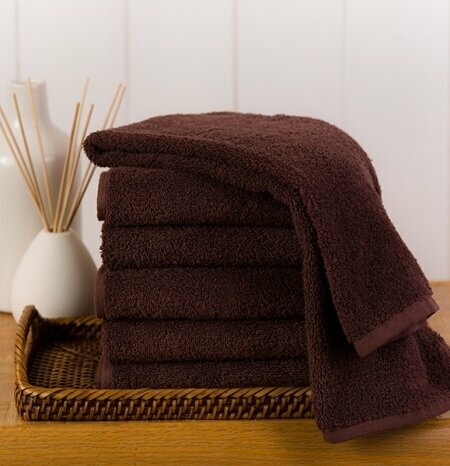 This bleach resistant towel in dark brown looks great, with its quality loops and its warm shade. If you’re looking for great hand towels, buy from Towel Super Center today. We offer 24/7 online ordering and fast delivery, so you can always buy your towels, no matter how hectic your schedule gets. And we don’t keep you waiting around for your order, either. Towel Super Center is able to offer wholesale pricing on all orders — even if you’re buying for your home. Why pay more? With excellent customer service and a vast selection of high-quality products, it’s no wonder savvy shoppers and businesses turn to Towel Super Center when they need towels. Order from us today to see for yourself.